Multi-faceted city. L: Parque Bicentenario in modern Vitacura. R: Historic central Santiago. 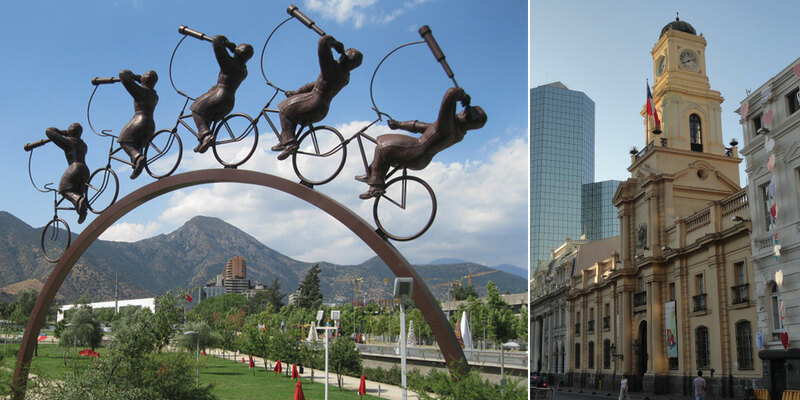 Nearly all visits to Chile begin in the capital city of Santiago. Most flights from the United States originate from either Atlanta or Miami, but New York, Houston and Dallas have direct service as well. Our Delta flight from Atlanta was 9 hours and 18 minutes overnight. The trip got off to a rough start due to weather. The Chicago to Atlanta leg of the flight was so bumpy that the flight attendants were not able to serve drinks and the landing was a roller coaster ride that ended with a touchdown in near zero visibility. Then our Atlanta to Santiago flight was delayed while a lightning storm passed, then upon receiving clearance to leave, we flew directly into that very thunderstorm, thanks Delta! Let’s just say if you’ve never been on a plane that’s been struck by lightning, consider yourself lucky. If you have been on one, I don’t need to tell you it doesn’t make for a relaxing flight. Much wine was consumed with dinner. One nice travel aspect is that since Chile is only 3 hours ahead in winter (2 in summer) there is not much of a jet lag factor. Santiago’s airport is manageably sized enough that we were through customs and out of the terminal just a half hour from landing. The throngs of people waiting at the international arrival gates holding signs with names on them made for an amusing entry into the country as well. View from the top of Santa Lucía Hill. Funicular de Santiago can be seen at the right edge. 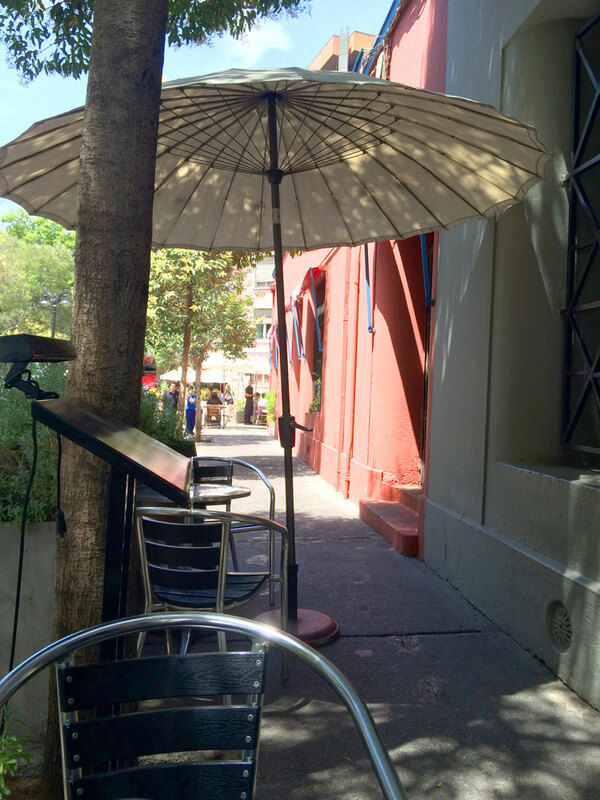 Sidewalk dining at Cafe Geometrico in Lastarria. drink stops. One of the best-known attractions in Bellavista is La Chascona, one of the homes of the famous Chilean poet, Pablo Neruda. An audioguide tour leads visitors through the eclectic house and narrates important events that occurred there. A short walk south, flanking one side of the Lastarria neighborhood is Santa Lucia Hill, another great place to climb up and check out the view. The hill stands 225 feet above the surrounding bustling neighborhoods and is a maze of fountains, paths, staircases, gardens and viewpoints. Well worth the climb. A short walk away is the Palacio de la Moneda, Chile’s governmental center. These sites are all easily accessible by taxi or by public transit, thanks to Santiago’s rapidly expanding Metro system. Parque Bicentenario greenery. Mestizo restaurant is in the background. Farther from the city center toward the northeast are the high rises of the more modern business districts of Providencia and Las Condes, including the 984 foot Gran Torre de Santiago, the tallest building in Latin America and second-tallest in the Southern Hemisphere. These areas don’t have the quaintness of the downtown area but they do have a high concentration of great shopping and some amazing restaurants. We especially enjoyed Köök and Mestizo in the Vitacura neighborhood. Mestizo sits at the northern end of another great Vitacura location, the Parque Bicentenario. 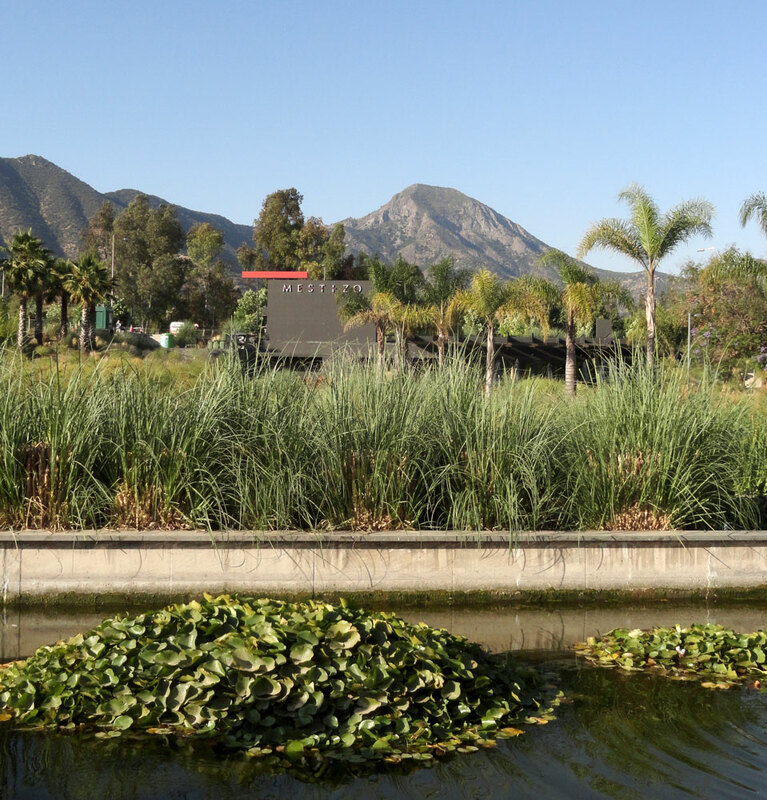 Construction of this 78 acre park began in 2007 and contains multiple playground areas, umbrellas to lounge under, a lagoon habitat for flamingos and a civic center. It’s a great place to walk, bike or just people watch. We rode bikes from Parque Bicentenary, across a bridge and up a hill to Parque Metropolitano where nice bike routes wind through the forest and offer views over the city in both directions. Up next I’ll give some more details of our time spent on the Pacific coast at Pichelemu and Punta de Lobos. See more photos of our entire visit to Chile here. 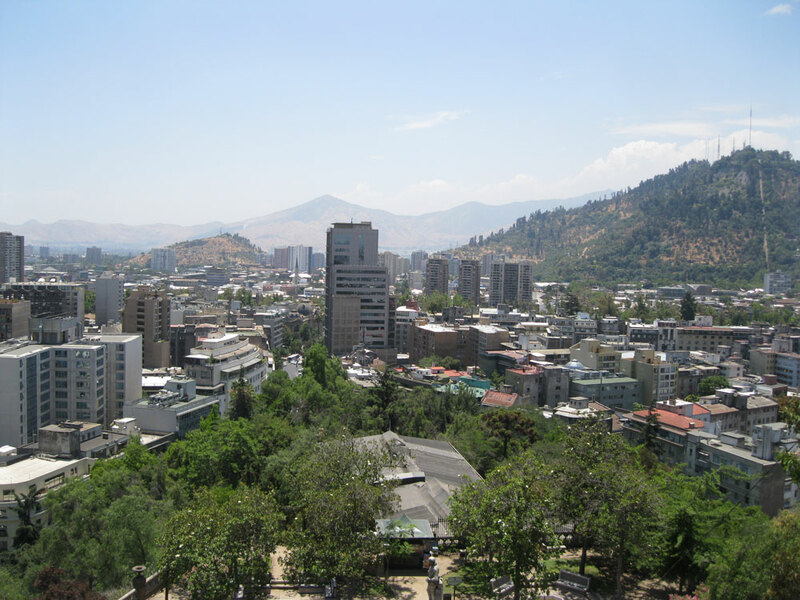 This entry was posted in Destinations, Travel Resources and tagged Chile, Parque Bicentenario Santiago, San Cristobal Santiago, Santa Lucia Santiago, Santiago, Vitacura. Bookmark the permalink.